Your lymphatic system is crucial for your immune system and for protecting you from inflammation and illness. If your lymphatic system is congested, it cannot protect you effectively and makes you prone to infections and disease. Keeping your lymphatic flow smooth and free from lymph congestion is absolutely critical to your health and well-being. 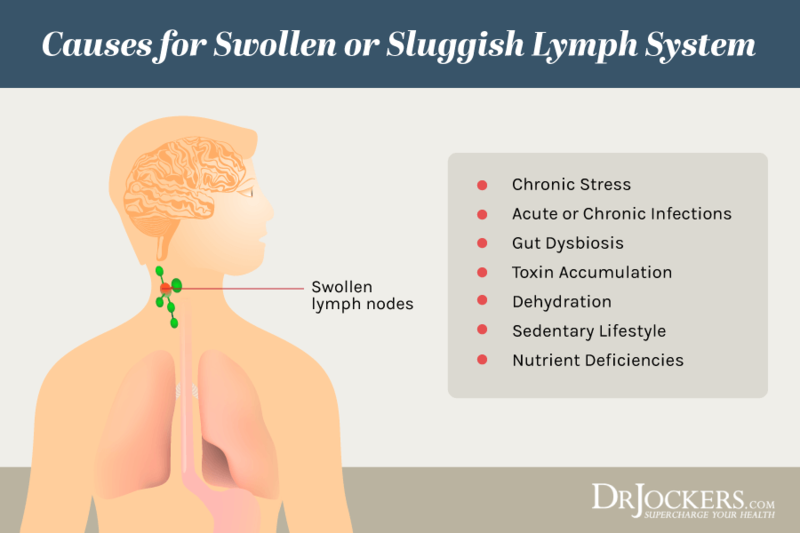 In this article, you will learn what your lymph system is, how it may get congested, the symptoms of lymph congestion, and how your lymphatic system becomes clean. I will share with your 8 simple ways to clear your immune system. Your lymphatic, or lymph system is a critical part of your immune system that is essential for protecting you from inflammation and illness. The main role of your lymph system is to keep your fluid levels in balance while protecting you from infections, bacteria, cancers, and other potential threats. Your lymph system is a network of blood vessels and lymph nodes working together to carry fluids from your tissues to your blood and vice versa. It is basically your body’s inner drainage system. Your lymph system is quite similar to your circulatory system which is made up of veins, arteries, and capillaries to carry your blood around. Your lymph vessels are smaller than your veins. They carry around a clear, watery fluid called lymph, as well as protein molecules, glucose, salt, and other substances (1). 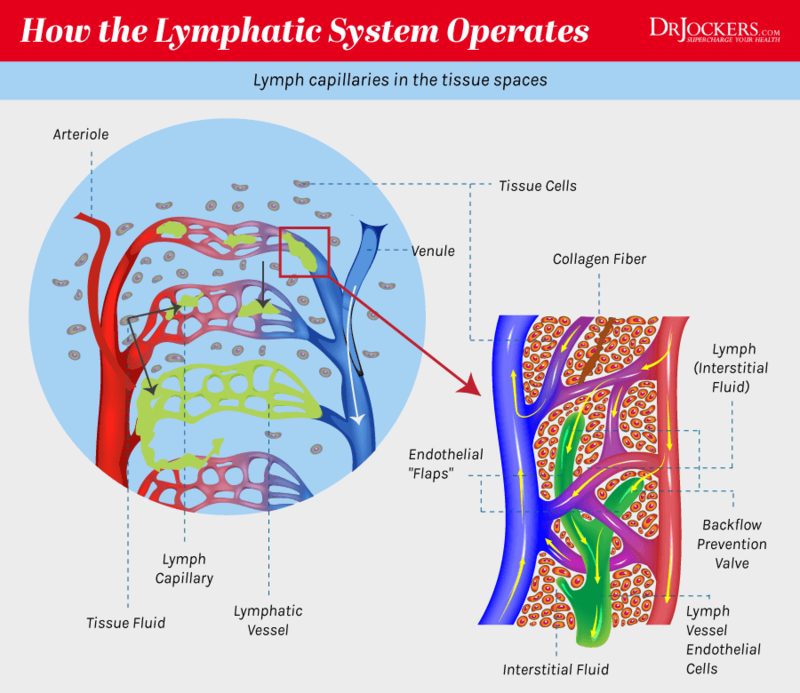 Via the lymphatic vessels, fluid travels around your body. Valves function as ‘stops’ to ensure fluids are carried to the right place and don’t move the wrong direction. Besides your lymph vessels and nodes, your lymph system includes several organs such as your tonsils, spleen, thymus, and adenoids. 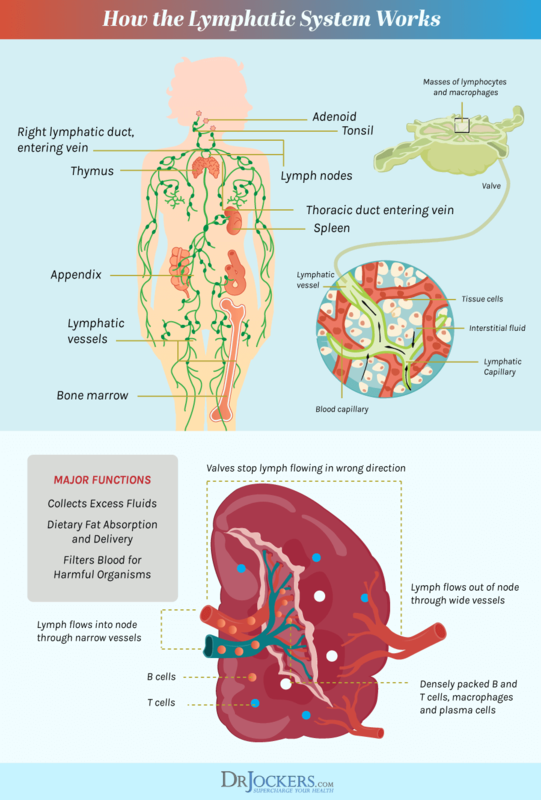 Your lymph nodes are another important part of your lymph system. They are found in a variety of areas of your body, including by your throat, groin, armpits, chest, and abdomen. Your lymph nodes play a critical role in fighting infection, recovering from illness, and healing wounds because your immune cells are created within them. They can recognize harmful organisms and trigger the creation of infection-fighting white blood cells called lymphocytes. When you come in contact with microbes, bacteria, or toxins, they make their way into your body and the lymphatic fluid. Once the fluid makes its way into your lymph nodes, these organisms get trapped and your immune system can attack and destroy them. Inside the lymph nodes, these harmful organisms are filtered out and white blood cells are created to protect your body. Your lymph system also helps to keep bodily fluids in balance. This means that if your lymph system is healthy and well-functioning, you won’t experience abnormal water retention or painful swelling. Your lymph system takes care of any fluid build-up or swelling due to injury or health issues. Chronic stress is one of the main causes of most chronic health issues. It can also lead to lymph congestion. When you are under stress, your body creates stress-fighting hormones which result in free radical waste products that can lead to a variety of health problems (2). Chronic illness may lead to lymph congestion throughout your body. When your body is fighting chronic inflammation and microbes, your body is creating more white blood cells to fight them. However, they may end up filling up your lymph nodes, backing up the system, and creating swelling. Another reason for lymph congestion is digestive imbalance. Digestive imbalances may irritate the intestinal villi resulting in a common reason for lymph congestion. The majority of your lymphatic system surrounds your gut with the Gut Associated Lymphatic Tissues (GALT). Hence your gut health and the health of the intestinal villi is essential for lymph flow, detoxification, and immunity. Not drinking enough water and lacking physical activity can result in your lymph fluid slowing down. Your lymph system relies on pressure from muscle movement and breathing to move fluids around. Lacking this pressure due to a sedentary lifestyle or chronic dehydration may slow and congest your lymph system. Lastly, nutrient deficiencies may lead to lymph congestion as well. In particular, iodine, magnesium and vitamin C are important to mitigate the harmful effects of environmental toxins and to support your lymph system in protecting your body. 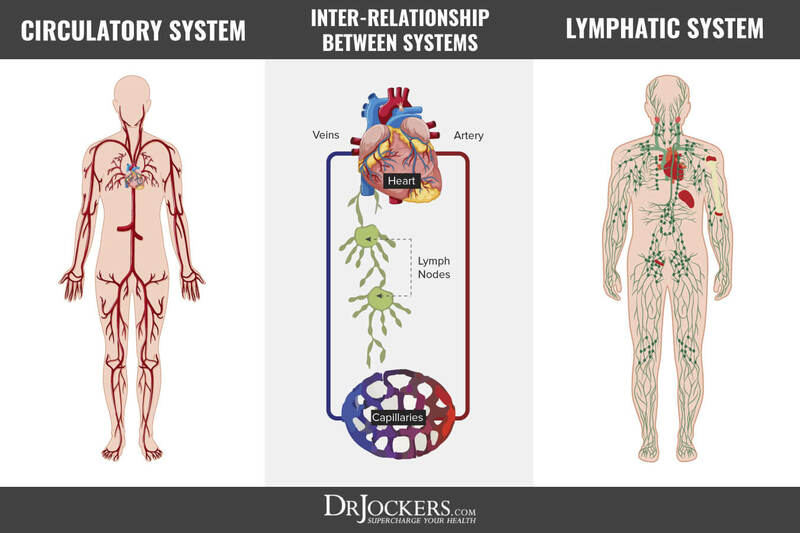 While your lymphatic system is similar to your circulatory system, unlike blood, lymph does not have a pump, therefore has to rely on the contraction and relaxation of muscles to move it around. It’s no wonder that an unhealthy lifestyle that doesn’t stimulate the healthy lymph circulation can easily overwhelm and congest the entire lymph system. The good news is that there are a variety of techniques you can use to clean your lymph system. First, let’s discuss how your lymph system is cleaned, then take a look at some specific ways to clear lymph congestion. When you thinking about cleansing a congested lymph system, your upper chest region becomes key for final drainage of toxins and ultimate cleansing. Stress reduction techniques can encourage the contraction and relaxation of the muscles to help push toxins out of your body and to decrease the chance of debris building up. Deep breathing can promote intrathoracic pressure to improve the oxygen supply to your cells. Your rib cage is a major lymphatic pump that is necessary for healthy lymphatic flow. Healthy posture and exercise are also essential to facilitate the supply of oxygen to your cells and to support lymphatic flow. Furthermore, there are other strategies, including massage and dry brushing which you can utilize to stimulate the lymph system all over your body to remove debris from all parts of the system (4). It is not difficult to keep the lymph moving around your body. All you need to do is to incorporate a few simple, natural lifestyle strategies, such as deep breathing, optimal hydration, regular exercise, dry brushing, and herbal remedies to clean your lymph system. Let’s look at 8 simple ways to clear lymph congestion. Remember, your rib cage is a major lymphatic pump that is necessary for healthy lymphatic flow. This means that while exercise is essential for your lymphatic health, deep breathing is just as important. Deep diaphragmatic breathing allows your lungs to press into the thoracic duct which presses fluid back into your bloodstream. Deep breathing facilitates proper lymph movement and detoxification. To practice deep diaphragmatic breathing, breathe deeply through your nose, hold it in for four counts, then exhale for two counts through your mouth. Gradually increase how long you hold and release your breath until you can hold for 20 counts and exhale for 10 counts. Repeat this two to three times per session. Practice three times a day for the best results. To learn more about the revitalizing power of breathing, check out this article (5). Besides breathing exercises, you can try other stress reduction strategies to clear lymph congestion as well. Physical and emotional stress can both increase the risk of lymph congestion and health issues, so having effective strategies to cope with daily stress and to reduce overall stress is essential. Mindfulness practices, meditation, guided imagery exercises, visualization techniques, grounding exercise, journaling, tai chi, yoga, spending time with loved ones, and playing with pets can help you to remain calm in the present moment, slow down, reduce stress, increase joy, and improve lymphatic flow. Lymph is about 95 percent water, hence it is not surprising that optimal hydration is absolutely key for the proper health and functioning of your lymphatic system. Without enough water, the lymphatic fluid cannot flow properly, which can lead to lymph congestion and dehydration (6). 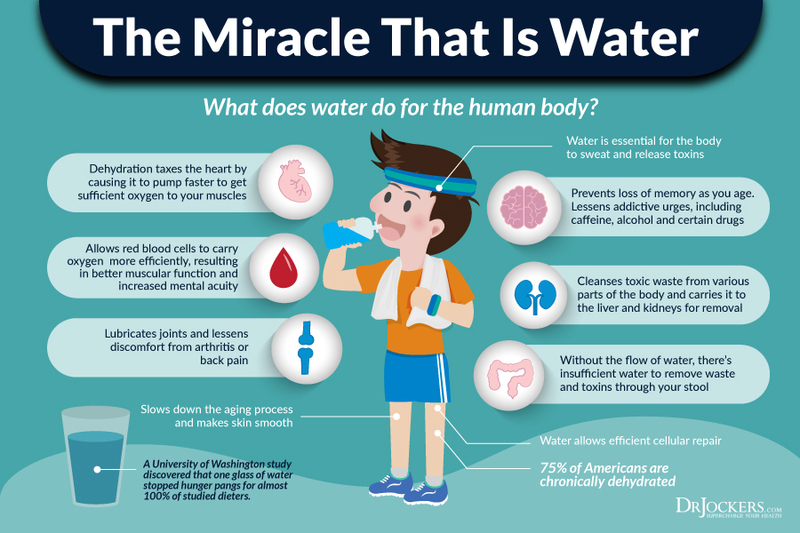 Water is absolutely essential to hydrate and rehydrate your body. Adding lemon or lime to your water can expedite the process of hydration and achieving a healthy lymph flow. Lemon water is fantastic for hydration and detoxification. Lemon and lime also encourages an alkaline environment and helps to mineralize your lymph and body (3). You may also want to try a specific Ayurvedic strategy to encourage lymphatic rehydration and lymphatic cleansing. Drink cold or room temperature water as you normally would to meet the daily requirement of 8 to 10 glasses. On top of that, sip warm water every 10 to 15 minutes throughout the day to encourage lymph flow. Keep up this protocol for two weeks for the best results (3). Regular exercise has many health benefits, including clearing lymph congestions. In fact, it is one of the easiest and most effective ways to boost your healthy lymph flow. The best part is that you don’t have to focus on any specific form of exercise. Lifting weights at the gym, running, swimming, playing with your dog, hanging out outdoors with your kids, dancing, doing a home workout video, or going for a family hike can all benefit your lymphatic system and improve your immune function. 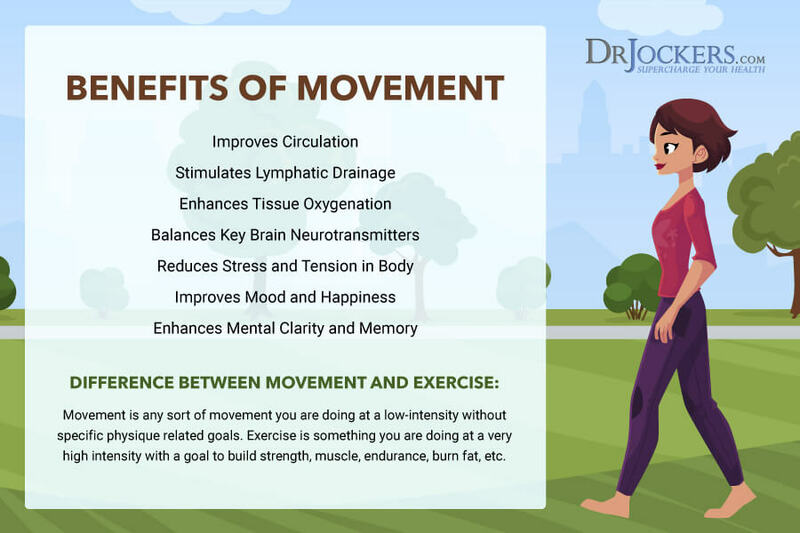 Regular exercise can increase the oxygen supply to your tissues, stimulate blood circulation, help the transportation of oxygen to your tissues and cells and reduce toxic buildup. As a result, exercise not only facilitates a healthy immune response but may prevent cancer by reducing the risk of a low oxygenated environment in the body where cancer may grow (7). A specific form of movement that is fantastic for purifying your lymph system is rebounding. Rebounding is an increasingly popular low impact exercise that involves jumping on a trampoline. 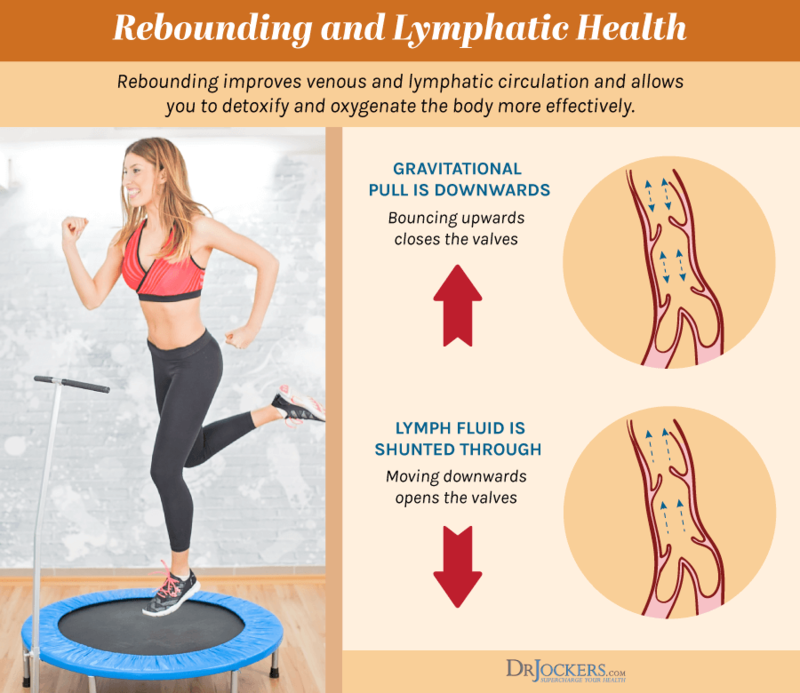 Rebounding promotes the flow of lymph through your body. It can increase the drainage of fluids and the removal of toxins. While you can certainly use your child’s backyard trampoline, you can also find mini trampolines online to use inside your house. Not to mention that trampoline jumping gyms are popping up in many cities offering a healthy and fun family activity. You can feel like a kid again while rebounding and taking care of your health. Dry skin brushing or dry brushing is an Ayurvedic technique that can boost circulation, lymphatic flow, and detoxification. This technique helps to remove dead skin cells and toxic waste, stimulate your sweat gland by opening your pores, improve immunity, prevent cellulite, initiate the development of new healthy skin cells, and promote lymphatic cleansing. To practice dry brushing, find a brush with soft, natural bristles. Avoid synthetic or hard bristles. Begin with light, gentle brushing strokes always moving toward your heart to improve lymphatic flow back through the venous system toward your heart. On your stomach, practice a clockwise motion to improve your natural digestive flow as well. The best time to practice dry brushing is before your shower or before a healing bath which will help to wash away dead skin cells and further improve lymphatic flow. You can learn more about dry brushing here. Healing baths are soothing baths that can boost your immunity, reduce stress, lower pain levels, and help relaxation. You can make healing baths by adding essential oils, Epsom salt, sea salt, ginger, and other natural substances to your bath, all with different benefits. Essential oils, such as lavender or frankincense are fantastic for relaxation, an immune boost, stress relief, anxiety, and sleep. Epsom salt baths are fantastic for detoxification, circulation, and lymph flow. Sea salt baths are amazing for inflammation, detoxification, skin hydration, and skin issues (8, 9). To learn how to make my 10 favorite healing baths and the benefits of each, read this article. Once you’ve picked your bath, soak for 20 to 30 minutes with a good book, music, or a relaxation audio guide. Turkey Rhubarb is a powerful herbal remedy that smooths the muscles of your intestines. It is highly effective for detoxification, cleansing, and constipation (10). Sheep Sorrel is an effective herb to reduce inflammation, respiratory problems, swelling, and diarrhea. It may also be used for soups and sauces (11). Slippery Elm Bark is an herb that Native Americans used to remedy fevers, wounds, and sore throats. It may be effective for inflammation, sore throats, cough, inflammatory bowel disease (IBD), urinary tract infections (UTIs), and digestive issues (12, 13). Astragalus Root is commonly used for its immune-boosting benefits. It may also be beneficial for longevity, heart health, blood sugar issues, and sexual health (14). Graviola Chuchuasi is a powerful remedy full of antioxidant and anti-inflammatory properties. It may be beneficial for blood pressure issues, blood sugar problems, stomach concerns, infections, and cancer (15). Bioactive carbon works as a systemic biotoxin binder in your body. It contains a high-energy carbon with an increased binding ability. It supports detoxification of mold, ammonia, bacteria, and other harmful invaders effectively. It also boosts and supports your immune system. I recommend Lymphatic Detox to my patients, friends, and family who want to clear lymph congestion because it utilizes all the benefits of Turkey Rhubarb, Sheep Sorrel, Burdock Root, Slippery Elm Bark, Astragalus Root, and Graviola Chuchuahsi. Lymphatic Detox is a unique Bioactive Carbon product that focuses on the drainage and immune support throughout your lymphatic system. It can improve your immune system, flush toxins from the body, and improve lymphatic flow. You can take it with or without food. Simply take one capsule twice a day and you are set to go. Taking alternate showers can stimulate your lymph system and provide an array of great health benefits. 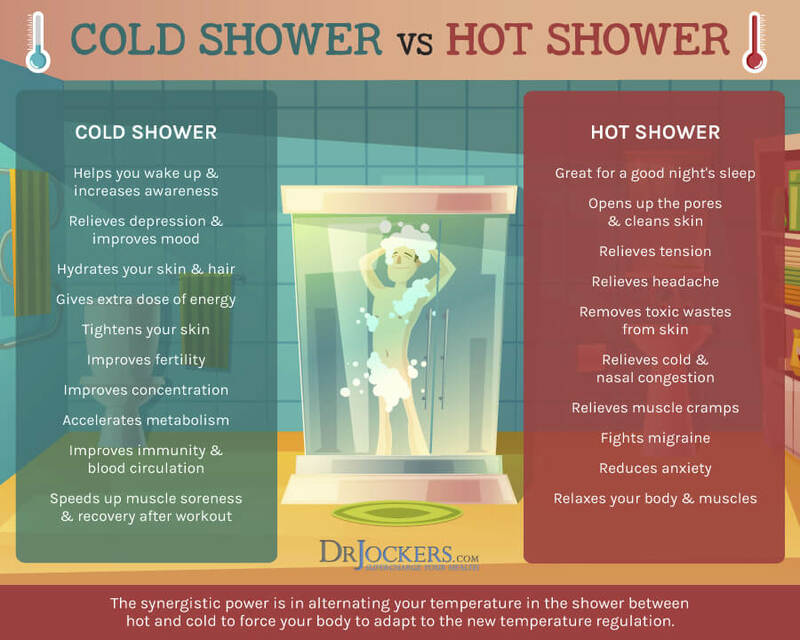 Cold showers and alternate showers may improve chronic pain, give you more energy, boost your brain function, and improve your mood (16, 17, 18, 19). Alternate showering can have a powerful effect on your circulation and lymphatic flow. The sudden exposure to cold constricts your blood supply, while the exposure to heat dilates and expands your blood vessels allowing your body to drive blood into areas that need it. Alternate showering improves muscle contraction through your body that allows whole-body contractions to squeeze lymphatic flow through your system and boost lymphatic cleansing. Hot-cold alternating showers can improve your inflammations and boost your overall health (20, 21, 22). To practice alternate showering, finish your shower with 30 to 60 seconds of cold shower. You may experience similar benefits if you take a cold shower or jump into a cold pool after spending some time in an infrared sauna or in a hot tub. To learn more about the benefits of alternate showers, read this article. Having a massage is not only relaxing and pleasurable, but it has also been shown to improve your immune function and relieve symptoms of chronic pain and fatigue. Massage can increase the flow of the lymph fluid and blood flow to your muscles while reducing fluid buildup, preventing swelling, helping tissue repair, enhancing performance, and aiding in quick recovery. Lymphatic drainage massage is a specific form of specialized massage therapy designed to help your cells release toxic buildup, reduce lymph congestion, and help flush excess fluid within your tissues. It can lower your pain intensity as well (4 23, 24). Other forms of massage therapy, such as deep tissues massage, shiatsu massage, or Swedish massage, can help to activate your lymph system, flush excess fluid, reduce pain in swollen lymph nodes, and reduce muscle and joint pains. You may also benefit from foam rolling for self-myofascial release and other self-massage strategies, especially before or after exercise. You may couple massage with essential oils or an Epsom salt bath for further lymph stimulation. There are over 80,000 toxic chemicals used regularly in the US and over 500 chemicals stored in the body of an average individual. Clearly, environmental toxicity is a huge concern that can lead to a clogged lymph system (25, 26). Perspiration through sweating is one of your bodies key mechanisms to remove toxins. While exercising is essential for sweating and cleansing, infrared sauna therapy is something you can also benefit from to improve your lymphatic function and which will benefit your overall health (27, 28, 29 30, 31). Infrared saunas are a non-invasive form of light therapy. They heat your internal muscles, push toxins to your circulatory system, and encourage removal of these toxins. Infrared saunas are much more effective than steam saunas. While in traditional saunas that use air and steam to create perspiration, the sweat that leaves your body contains 97 percent water and 3 percent toxins. On the other hand, infrared saunas use heaters that emit radiant heat that helps you to perspire 80 percent water and 20 percent toxins. You can read more about the benefits of infrared saunas here. Your lymphatic system is absolutely essential for your immune system and for protecting you from inflammation and illness. If your lymphatic system is congested, it makes you prone to infections and disease. Keeping your lymphatic flow smooth and free from lymph congestion is crucial to your health and well-being. Thankfully, there are some powerful and simple ways to clear your immune system. These lymph congestion clearing strategies include exercise, rebounding, deep breathing, infrared saunas, healing baths, alternate showers, optimal hydration, massage therapy, and specific herbal therapies. If you are serious about clearing up lymph congestion, I highly recommend Lymphatic Detox. This supplement utilizes all the benefits of specific herbs, including Turkey Rhubarb, Sheep Sorrel, Burdock Root, Slippery Elm Bark, Astragalus Root, and Graviola Chuchuahsi. One capsule twice a day can effectively support your lymphatic system and can serve as a fantastic addition to the other lymphatic cleansing strategies you’ve learned about. 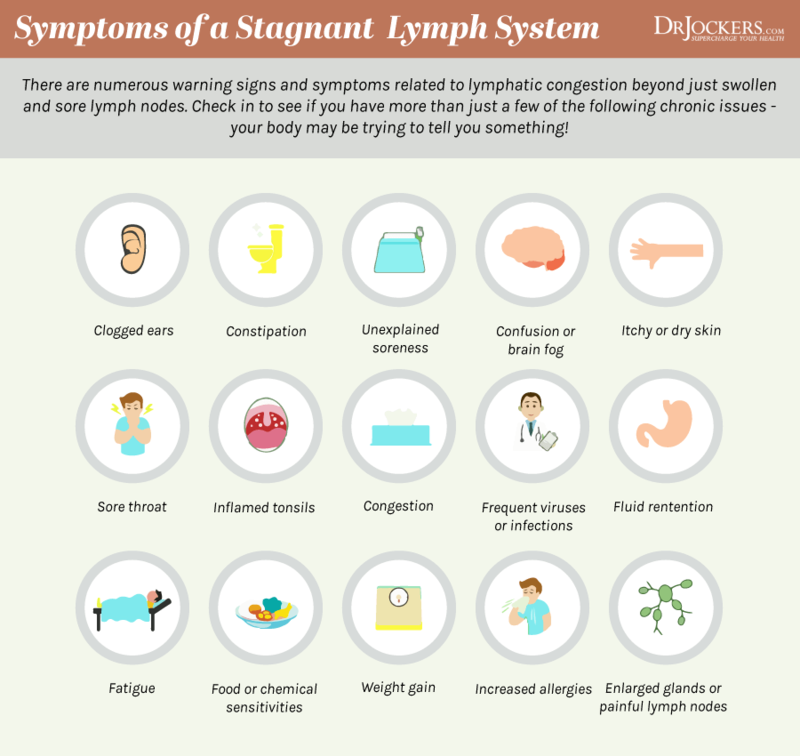 Using the 8 strategies you’ve just learned about and taking Lymphatic Detox daily can help you to clear lymph congestion and achieve the maximum health you deserve. 29. Vatansever F, Hamblin MR. Far infrared radiation (FIR): its biological effects and medical applications. Photonics & lasers in medicine. 2012;4:255-266. I was impressed with your knowledge and willingness to share it with us who want to know when you spoke on the Thyroid seminar. Thanks so very much. This article on the lymphatic system and its great need for it to work properly in the body is very impressive also. Thanks. So, it is a delight to find a functional doctor who understands the body completely and is willing to help. Thank you for your kind words Vernise! A highly educational article. Thanks v. much! Thanks for your information. WWandae need more people like you! God bless you! Hi Peggy, Yes. This article has great information: https://drjockers.com/hypothyroidism-nutrition-plan/. Praying for you!